1:16 (3/4) Scale Set 5-6 Adult Dolls & Fits Nicely with other 1:12. HTF ROBIN EGG BLUE PETITE PRINCESS BATHROOM SET. Old Plastic has changed Colors over time like Vintage Bakelite! All the Pieces - Whole Set Ready to Go! Set (No Bathroom Stool though). 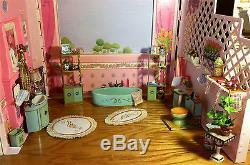 Also have many individual single Petite Princess Bath, Kitchen, etc. Petite Princess, Princess Patti Vintage Bathroom of the Old 1:16 Ideal Toy Company Line from 1965. People love these Devine Dollhouse. Pieces today for elegant durability & completeness which makes very collectible f. Urniture groupings that were made for more affluent children back in 1965, over 50 years ago. This plastic is a bit like Bakelite & Changes Colors over the years. We Love the way the Sink Cabinet aged to a lovely green on one door of sink & 1 door of each shelf! The others Stayed Robin Egg Blue. Often we see 1 door is Green & the other Blue. Dolls & Rugs NOT INCLUDED! 1 Bathtub 5¼W x 2H x 2 7/8D 1 Sink 3¼W x 5¾H x 1 1/8D 2 Cabinets 1 7/8W x 5½H x 1 1/8D 1 Toilet 2W x 2¼H x 2 7/8D 1 Hamper 1 3/8W x 2 316H x 5/8D 1 Table 1¼Dia. X 2H 1 Wastebasket 1W x 1 1/8H x ¾D 1 Bird Lamp 1W x 2H x 1Dia. Plastic Composition Furniture Marked Ideal Japan DOLLS/ROOM NOT INCLUDED & (For Size Purposes this Display Room is 14W x 14D x 14H but all will fit into a much smaller area). 3 Standing Pictures (1 CS Faux Tile, 1 Shell Pic, 1 Flowers), 3 Set Towels Striped Pink Jersey 11pc. 9 Perfume Bottles, 1 Wood Lamp, 2 Plants, 3 Statues (1 Gold Girl, 1 Bird Nest, 1 Egg), 1 Flowers Can, 4 CS Box (1 Tissue, 1 Soap, 1 Hamper, 1 Décor) All Included with Set. All Pieces matching Gold Trims. Lots of Original Accessories included. One small repair on Left Door of Sink Cabinet, just on hinge. Not noticeable, added 4 painted gold dots to Cupboard Door Corners for Matching Effect. Sink Vanity Mirror is original glass, All doors are in good working order. Right door on one cabinet is missing. 5 Original PP bottles, soap, & all handles present. Towels, & have handmade others. Swan heads are missing from top of sink vanity. These are all tiny and minor wear for years of play. These pieces are actually Princess Patti that was created in 1965 to add to the Petite Princess Line. Some Petite Princess Store Displays were modified for the. A top floor was added. To showcase the Bathroom & Kitchen. Search Princess Patti for wonderful pictures of this rare display. Petite Princess Furniture, 4 Dolls called the Fantasy Family, & Fantasy Rooms. 1965 Princess Patti Line started to sell. 1966, a Furnished Carry Case. Dollhouse was created containing many. In Hollis Queens New York, went. Out of business over 20 years ago. Unbelievable Prices, including the one here! Enjoy the Beauty of these fine collectibles too. True Stunner complete with additional Towels, TP Roll, Decorations, & Perfume Bottles! & Accessories Listed in Blue ONLY - NOT INCLUDED = Dollhouse Fold-up Room, Rugs, & Dolls not included! We don't polish items& leave original patina. Can polish any piece upon request. No cracks, Some Scuffs in this ALL SOLID DOLLHOUSE SET. Excellent Vintage Condition & Sublimely Nice. Please attempt to be sure it's acceptable to you. We'll attempt to describe item as seen, of course flaws, wear, slight damage may be part of vintage items & we'll disclose the information. The item "Petite Princess Ideal Rare 1960s Dollhouse Bathroom Tub Sink Toilet Hamper 112" is in sale since Monday, January 09, 2017. This item is in the category "Dolls & Bears\Dollhouse Miniatures\Furniture & Room Items". The seller is "mamacraftsart" and is located in Modesto, California. This item can be shipped worldwide.